Jonathan has more than eight years of experience in M&A, successfully completing 35 investment banking transactions totaling $940 million. While selling one’s company can seem like a daunting and difficult task, there exists a proven model and framework that drives valuation to maximum levels and leads to deals successfully getting done. This post is to help guide companies and entrepreneurs that are contemplating a sale as to what the primary and secondary valuation drivers are in an M&A sale process, summary points as to how a sale process is conducted, and the value that an M&A expert can add to the proceedings. The ability to think through the sale process and investment opportunity strategically and to anticipate the main issues and negotiation points is a unique and specialized skillset. The proven ability to drive valuation higher and to push transactions to completion ultimately leads to converting the value of the business into tangible, liquid wealth. What Are Primary and Secondary Valuation Drivers? 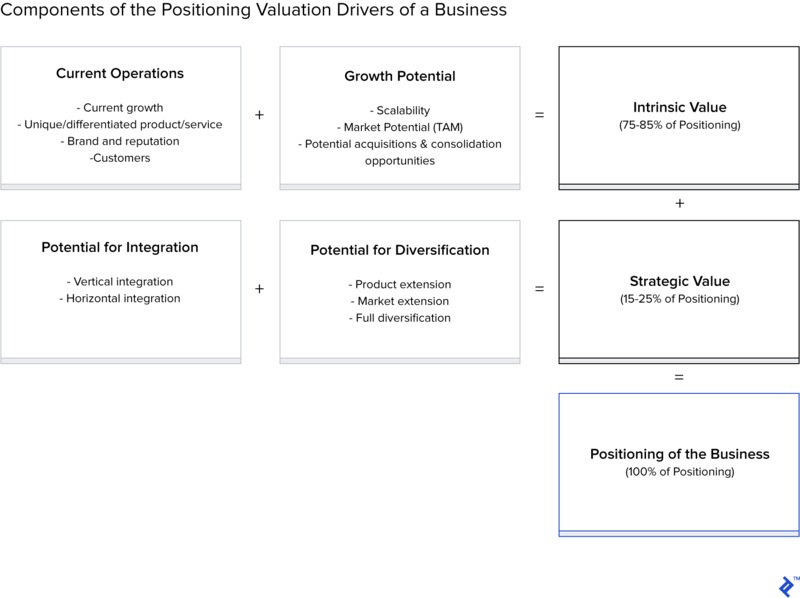 Premium valuation—a valuation well in excess of that of a company’s current valuation (if publicly traded) or in excess of the company’s peer group on a relative basis (if privately held)—is achieved through the combination of the right positioning of the company/investment opportunity and an effective M&A sale process. The percentages featured in the above infographic are illustrative of a typical M&A sale process. In practice, each transaction and subsequent outcomes are unique and can vary significantly depending on a variety of factors. Properly positioning an acquisition opportunity (company or target) to the investment community (investor) is both science and art (a very common cliché, but true nonetheless!) and comes in a variety of forms and deliverables (i.e., via the initial investment or company presentation, initial follow-up calls, follow-on dialogue and Q&A with interested investors, management presentations, subsequent deal and legal negotiations, etc.) and is presented and distilled over the course of a number of months. Intrinsic Value: What is the intrinsic or inherent value of the current business based on current operations and growth potential? 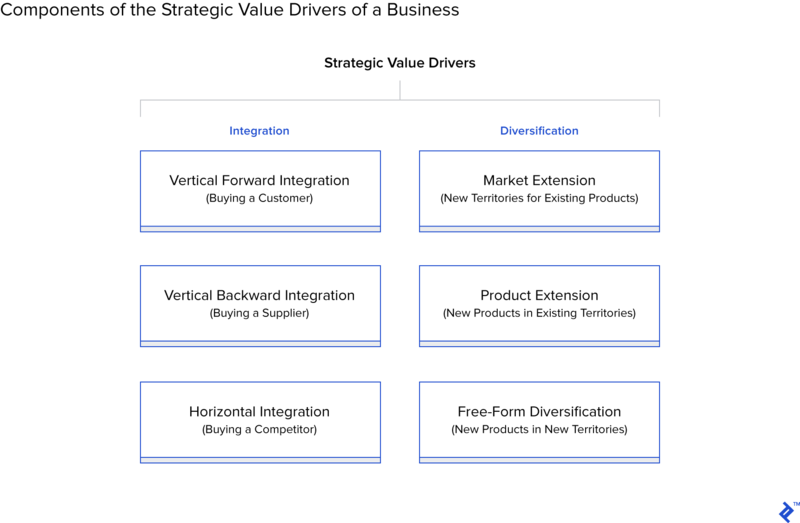 Strategic Value: What is the incremental value to the investor, above and beyond the current intrinsic value? Illustrative percentage figures, as noted above. Staying consistent with the art/science representation, knowing where to look for key “salable” highlights is both scientific and formulaic. Knowing how to digest and present them to the investor is certainly more artful and more of a moving target, and there is no substitute for deal experience when it comes to effective positioning. For example, any entrepreneur or business owner is well equipped to derive recent trading multiples (Enterprise Value (EV)/EBITDA, for example) for comparable transactions in one’s industry and apply them to the current EBITDA to arrive at a baseline valuation. However, having a deeper understanding of what is driving current and forward EBITDA, and being able to defend this position (both the EBITDA metric itself and what drives it, as well as why the market multiple, or ideally a higher multiple, is adequate and applicable to the target), is crucial to the M&A process. Given that investors make it their livelihood to invest in businesses and given that there is no shortage of deal flow, investors typically have an informational advantage over a business owner or entrepreneur that has done far fewer transactions, and in many cases, is transacting for the first or second time. It helped investors better understand key areas of the business while also giving them confidence in the opportunity and in the management (thus enhancing the positioning). It also added to the competitive tension (this is key to running an effective process, which I will touch on shortly), one main implication to the investors being that other investors may have already asked similar questions, given management’s fluid, “natural” responses. Potential for new and/or enhanced growth, in and of itself, is what really whets the investors’ appetite. At the same time, understanding and verifying from where this new growth comes will be a key area of focus for the investor, so the target can expect a good amount of questions and “hole poking.” On one hand, no one truly understands a specific business better than the business owner or entrepreneur. On the other hand, investors with a track record for both identifying and executing on successful growth opportunities bring years of experience and confidence to the table in terms of assessing a range of potential outcomes and, ultimately, the likelihood of success. Good financial advisors, as one example, will guide the company and management toward the right balance of projecting aggressively (science), yet also realistically (art), and will spend a good amount of time fine-tuning, testing, and verifying the assumptions prior to speaking with investors and approaching the market. This primarily serves to arm management with the proper tools, information, and knowhow to address potential questions and concerns throughout the process. Additionally, investors love growth and more so when companies exceed projections during a process. This can potentially raise valuation even higher but also lower it if actual performance disappoints. Proper guidance and advice protect against this type of situation. Another example is that a well thought out and prepared TAM (total addressable market) analysis is very helpful in highlighting the company’s growth potential. Sticking with the same recent SaaS company example from above, we were able to effectively calculate and produce a well-thought-out and reasoned quantitative approach to assessing the total market size and the current penetration of the market opportunity. This involved pulling numerous statistics and market data, coupled with both the company’s current and expected sales performance metrics, and preparing a detailed and well-thought-out analysis that also passed the investors’ “smell test.” The resulting analysis successfully educated investors as to the full market opportunity while maintaining the position that this was a premium asset, ultimately leading to a successful transaction. Properly positioning strategic value to the right investor has the potential to significantly raise valuation during a sale process. In general, there are numerous reasons for a merger or acquisition as it pertains to generating strategic value, or “synergies,” for the investor. These synergies loosely fall into two main categories: integration and diversification. An advisor will help to highlight and position the relevant synergies with the goal of demonstrating how these relevant synergies are more valuable to the current potential investor than to another buyer, and thus increasing the purchase price. Each transaction is unique, and more specifically, potential synergies to each potential investor involved in the same sale process may also be different. An advisor’s intimate knowledge of the M&A market, the specific sector, and each specific buyer is a great resource to help the company think through, quantify, and present these potential synergies. Without going into too much detail, I will briefly highlight how we modeled out these synergies (science) and provide some commentary on the negotiation strategy (art). This synergy helped guide the buyer into making a premium offer, as 1) there was a clear road map to immediate revenue growth above what the buyer was currently generating, and 2) it allowed the buyer to capture this revenue while also preventing a competitor from receiving any benefit. At this stage, I am confident that you get the idea, so I will be brief. For the domestic growth synergy, we used a similar approach to that of the foreign one and modeled out the current effectiveness of the company’s ability to upsell (currently in pilot form in a handful of locations) by looking at sales conversion statistics and average sale price. We then extrapolated that out onto the company’s current entire footprint while using rollout assumptions consistent and in line with historical performance. In conclusion, both initiatives brought significantly more value to the eventual buyer over that of another buyer. The result was a successful transaction in which the offer to purchase the company was a price per share at a 61% premium to the 12-month average share price. Background: In practice, while launching an effective process is very much a science (efficient timetables, diligent follow-up and preparation, process management, etc. ), proper negotiation strategy and execution of this process is very much both art and science. More importantly, an effective process encapsulates the entire transaction, starting with early-stage diligence, proper strategy and positioning, drafting of Investment and management presentations, calls with buyers, and deal and legal negotiations, etc. Running an effective sales process—while in dollar terms, it may represent a smaller piece of the overall valuation pie (above intrinsic and strategic value)—in real terms is ultimately how value is successfully realized, and there is no substitute for how best to complete a transaction. Using an illustrative example with representative figures derived from above, a specific company may intrinsically be worth $80 million and may be worth $100 million to a certain subset of buyers (a result of effective positioning). However, in a failed sale process, this same business would realize $0 in value. On the other hand, a successful process can not only lead to valuation higher than $100 million but also lead to full realization of this value. This is primarily achieved by creating a competitive environment and maintaining bidding tension among likely buyers. Further, while competitive tension is designed to drive up value, it also serves the purpose of pushing parties to a close. Deal certainty clearly has value, and having a proven financial advisor that can push deals through closing is paramount in terms of adding value to the process. To demonstrate how competitive tension can extract maximum value, I will provide a specific example. I had advised a privately held SaaS company (different from the example above) in its sale to a publicly traded strategic acquirer. This target was particularly attractive to a variety of different buyer types mainly for its: recurring revenue characteristics, revenue and EBITDA growth, size of TAM, and market penetration. After having successfully positioned the company and contacted the most relevant investors, we had received 20+ initial bids from interested parties. Given this level of initial interest that we were able to obtain, we successfully maintained a very competitive bidding process through closing, which was enhanced by not granting exclusivity to any of the parties involved throughout the process. Exclusivity is typically granted to the winning or highest bidder closer to the end of the process as a way to mitigate the bidder’s own risk involved with spending time and money on confirmatory due diligence. Additionally, we were able to pre-negotiate several very favorable terms to which multiple parties agreed, involving: various representations and warranties (tax and IP), escrow amounts and terms, working capital, and the elimination of customer interviews (typically conducted just prior to signing and closing). This sale process resulted in a successfully completed transaction at a valuation that was more than double (2.2x) that of the lowest IOI received. Throughout my career, I have advised numerous clients in successful deal closings as well as unsuccessful ones. There exist a number of reasons both for why deals fail and for why investors ultimately buy companies, and while maximum M&A valuation is ultimately determined by how much an investor is willing to pay, there also exists a clearly defined roadmap (science) to successful deal-making. When combined with proven deal and negotiation experience (art)—competitive tension, effective positioning, and process management are necessary—successful outcomes are likely to be achieved. In conclusion, in every M&A deal in which I have been involved, the decision taken by the business owner to ultimately sell is one of the biggest and most important in their life. Deal-making ultimately comes down to people and relationships, and having a proven and trusted advisor who understands, empathizes with, and values your business should always be top of mind of the seller. The mergers and acquisition ("M&A") process is a transaction between the owners of companies and their constituent assets. It comprises a range of activities that involve strategy, valuation, negotiation, and the combining of corporate assets with the intent of upholding and increasing business value. Very nice and well-structured post, I very much enjoyed it. May I ask about how you “sell” the quantitative part of synergies to buyers when you are working for the selling side? It sounds like something which the buyer would be in a much better position to assess than you. What if you end up asking for less than the buyer would be willing to give? I prefer pointing out the potential for synergies to the buyer so that they know that we are aware of them, but not disclosing our estimated savings prior to receiving an offer, even a non-binding one. Also, I had never come across the concept of TAM. (Well actually, I think all of us have come across it, I just wasn’t aware that it was a “thing.” Now that I know, I will be presenting it as a separate thing to my clients!) Is the term “Premium Valuation” a definition of yours, or is it something that is used widely in your market? (I understand you are working in the US.) It seems to me that you are mixing up two seemingly similar, but different terms: Value and price. (Which is why some companies on the stock exchange are called under/over-valued—Their price is not deemed to be reflective of their true value.) A fine line perhaps, but this can make a difference in the Financial Statements of the buyer after the first year, when after assessing the fair value of the asset, (I am talking in terms of IFRS by the way) it will likely end up being significantly lower than the purchase price. I am aware that this is a tricky subject and I do not know if I would be able to express myself differently or end up using the same terms as you—just food for thought. Finally, why are you using the EV/Revenue multiple at the last table? I always try to use EBITDA, or in cases where this makes sense, EBIT, since these more closely resemble actual cash flows to the firm. 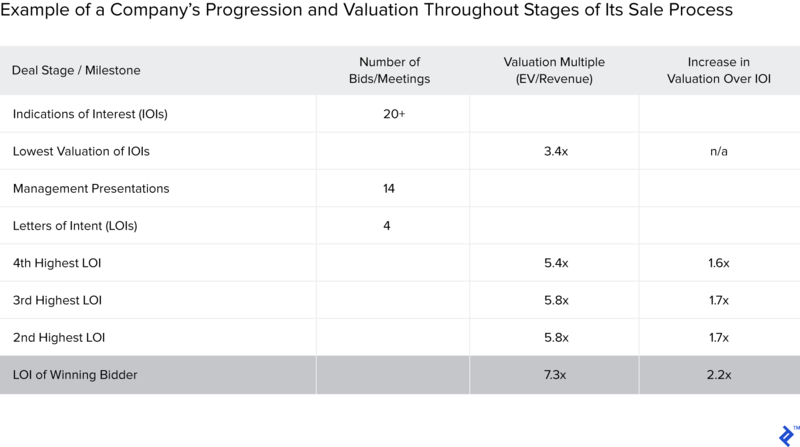 I have never seen a valuation using revenue multiples in isolation. Could you please explain why using this multiple was relevant in this case? Again, very good post, I even saved it in my favorites!